Wales manager Chris Coleman says that Sunday's Euro 2016 qualifier with Belgium could be decided by which side's star forward plays the best. Real Madrid's Gareth Bale is back to fitness for Wales after being hampered in Spain with a buttock injury. 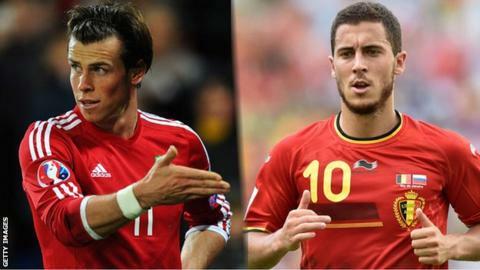 Belgium, meanwhile, have the quality of Chelsea's Eden Hazard in attack. "People talk about Bale and Hazard, they say Wales are a one-man team and if Hazard doesn't perform Belgium don't perform," Coleman said. "I think Belgium have got quality in every position but they're not invincible. "Can they stop Baley? If they have a good day and Baley has a bad day. But if Baley has a good day, good luck! "People will talk about Baley but our mentality now is we don't just accept losing. It's not acceptable. "We've worked hard at being harder, meaner, more streetwise and we've still got a way to go. "But compared to two years ago there's a steeliness about us and as a team we know how to win." Wales top Group B with seven points after wins over Andorra and Cyprus, and a draw with Bosnia-Hercegovina. Belgium have played one game fewer after their first fixture against Israel was postponed. Like Wales they drew with Bosnia, and they thrashed Andorra 6-0. Belgium have lost captain and defender Vincent Kompany to a calf injury, while Wales will be without suspended Leicester midfielder Andy King, Reading striker Simon Church (damaged collarbone) and Wolves midfielder Dave Edwards (knee ligament damage). But Wales's ranks have been boosted by the return to fitness of two key midfielders, Arsenal's Aaron Ramsey and Joe Allen of Liverpool. Belgium will probably pair Nicolas Lombaerts and Southampton's Toby Alderweireld at the heart of the defence, with Barcelona's Thomas Vermaelen also out with a thigh injury. But Coleman does not think the absence of Manchester City's Kompany will weaken their hosts too much in Brussels. "Kompany is a quality defender, probably one of the best central defenders on the planet," Coleman said. "He's a top captain also and would be a loss for anybody, but they've got bodies in there to make a change and be strong enough to give anybody a game. "I haven't learned anything new from watching them because we know we're up against a very good team offensively. "They're where they are in the rankings for a reason. They are a top team but there's no fear from us."